When you seek care at our office, you are assured that Dr. Boisson and his staff utilize the latest in technology to enhance the quality and fit for your dental care. Dentistry is micro-surgery. Using surgical telescopes enable us to create dental restorations with incredibly precise fit and finish. You just can’t fulfill that level of care with the naked eye. In addition to allowing precise, close-up work, the telescope directs a beam of light directly on the teeth, minimizing glare for you. At Boisson Dental Group we use electric hand pieces. This will bring more comfort to you as a patient with less vibration and less noise. Dr. Boisson chooses carefully which and when radiographs are taken. There are many guidelines that we follow. Radiographs allow us to see everything we cannot see with our own eyes. Radiographs enable us to detect cavities in between your teeth, determine bone level, and analyze the health of your bone. We can also examine the roots and nerves of teeth, diagnose lesions such as cysts or tumors, as well as assess damage when trauma occurs. Dental radiographs are invaluable aids in diagnosing, treating, and maintaining dental health. Exposure time for dental radiographs is extremely minimal. Dr. Boisson utilizes Digital Imaging Technologies within the office. Dental cone beam imaging is among the fastest growing dental technologies. Also called cone beam 3D imaging or cone beam computer tomography (CBCT), these imaging systems are capable of creating detailed 3D digital models of a patient’s anatomy. Cone beam imaging is becoming a standard of care for dental implant treatment planning, and the 3D imaging technology also is useful for orthodontics, endodontics and a range of other clinical imaging needs. Our 3D CBCT software allows us to assess bone levels and place implants in virtual reality. This allows us to know which size and shape of implant to place and exactly where to place it before we ever start the surgery. Doing so can help us to avoid costly grafting procedures in some circumstances. Instead of filling a tray with impression “goop” that you must bite into and hold in your mouth until it hardens, Dr. Boisson takes an Optical Impression. A camera is used to take a digital picture of your tooth. This whole Optical Impression process takes only a minute or two. The computer and CEREC 3D software converts the digital picture to a three-dimensional virtual model of your prepped tooth. Dr. Boisson then designs your restoration right on screen using the software while you wait (and watch!). This software can assist your dentist with designing any single tooth restoration: crowns, inlays (fillings), onlays (partial crowns), and veneers. Next, Dr. Boisson clicks a button, and the restoration design data is sent to a separate milling machine in the office. A ceramic block that matches your tooth shade is placed in the milling machine. About 10 minutes later, your all-ceramic, tooth-colored restoration is ready to try in. Dr. Boisson makes any minor adjustments to the restoration at this time and then puts the final glaze on the crown and fires it in the oven for ultimate strength. Finally, Dr. Boisson bonds the restoration to the prepared tooth and checks for a proper bite. Your tooth is restored with no “temporary” or return trip necessary. All of this is done in a single appointment! Ask us about CEREC today. The iTero Intraoral scanner is designed to eliminate the regular, uncomfortable impressions. 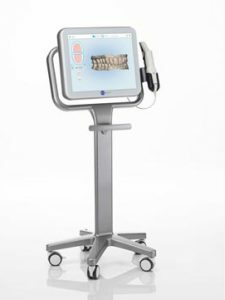 Impressions can now be taken without the “goop” and with just a quick scan of the intraoral camera. What is it and how does it help our patients? 3D printing is technology that allows us to fabricate surgical templates in our office for our implant patients. We first place an implant for our patient very accurately in virtual reality using a 3D scan (CBCT) of the bone as the reference point. Imagine that we are performing the surgery on the computer as a trial before actual doing it in the mouth. We are then able to superimpose that implant position onto a digital scan of the teeth and then utilize the 3D printer to create a guide to duplicate the position in the patient’s mouth. This results in faster, safer surgeries with more precise placement of the implants. Because of the degree of predictability and precision achievable with this system, we can often avoid costly grafting procedures that complicate and delay treatment.